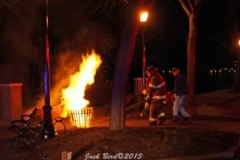 The following photo galleries show some of the fires fought by volunteer members of Walnut Street Fire Company No. 4 and incidents needing our support. If you have any firefighting photos you would like to add, please email them to us at contact@firecompany4.com. To enlarge a photo or view the slide show just click on any of the pictures below. To end the slide show click on the photo you’re viewing. Return to Action Shots photo album selections. Photo gallery featuring Walnut Street Fire Co No. 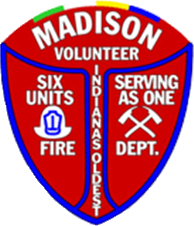 4 on various firegrounds and incidents in Madison, Indiana. NEW - photos from 415 W. Main St. fire. 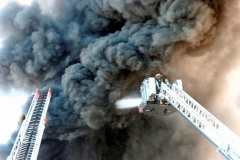 Action shots from the West Street Fire on April 27, 2012. Walnut St. Fire Co. No. 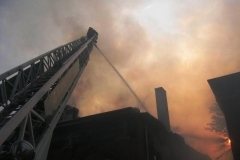 4 used their new aerial platform while fighting a fire at the Madison Courthouse. Walnut Street Fire Co. No. 4 was first-in at an arson fire that destroyed the Madison Elk’s Lodge, 524 West St., August 25, 2006. The Elk’s Lodge was fully involved upon arrival, and the old Madison City Hall to the south and a dentist\'s office to the north were beginning to ignite. Hand lines were immediately deployed to protect the exposures while the ladder pipe was set up to attack the main body of the fire. 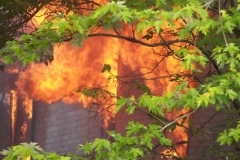 Three exposure buildings sustained damage and the Elk’s Lodge was gutted. The photo of Quint Four setting up the aerial was taken by the Madison Courier and sent over the AP wire, ultimately appearing in newspapers across the country including The New York Times. Become a Member of Walnut St. Fire Co. No. 4. See a List of our 2014 Incident Runs.